Hydroxycalciopyrochlore: Mineral information, data and localities. The Ca analogue of hydroxymanganopyrochlore and hydroxyplumbopyrochlore. The OH analogue of fluorcalciopyrochlore. Chemically related to charleshatchettite and 'Unnamed (MSH UK-56)'. Mostly as octahedra, and less often as dodecahedra and tetrahexahedra or combinations thereof. Some occur with an allotriomorphic habit with a thick triangular tabular form. 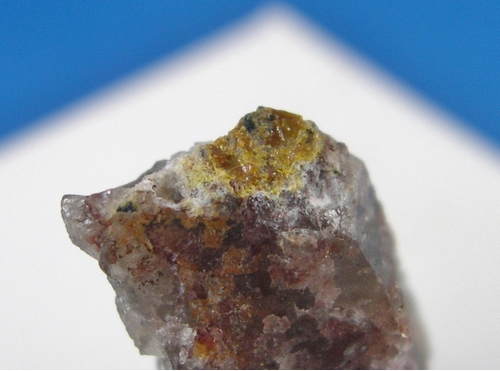 Alkali feldspar granite rare-earth ore deposit (26–27 Ma). Niobophyllite 2 photos of Hydroxycalciopyrochlore associated with Niobophyllite on mindat.org. Monazite-(Ce) 2 photos of Hydroxycalciopyrochlore associated with Monazite-(Ce) on mindat.org. Hogarth, D. (1961) A Study of Pyrochlore and Betafite, Canadian Mineralogist: 6: 610-633. Bonazzi, P., Bindi, L., Zoppi, M., Capitani, G.C., and Olmi, F. (2006) Single-crystal diffraction and transmission electron microscopy studies of "silicified" pyrochlore from Narssârssuk, Julianehaab district, Greenland. 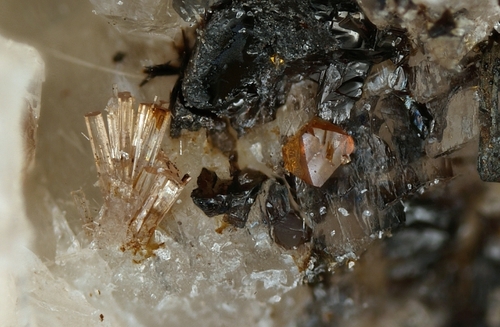 American Mineralogist: 91: 794-801 [as pyrochlore]. Yang, G., Li, G., Xiong, M., Pan, B., and Yan, C. (2011) Hydroxycalciopyrochlore, IMA 2011-026. CNMNC Newsletter no. 10, October 2011, page 2554. Yang, G., Li, G., Xiong, M., Pan, B., and Yan C. (2014) Hydroxycalciopyrochlore, a new mineral species from Sichuan, China. Acta Geologica Sinica - English Edition: 88: 748–753. Hogarth, D. (1961) A Study of Pyrochlore and Betafite, Canadian Mineralogist, v. 6, p. 610-633. Bideaux, R. (1997), v. 3, p. 457.; Hogarth, D. (1961) A Study of Pyrochlore and Betafite, Canadian Mineralogist: 6 : 610-633. Masson, S.L. and Gordon J.B. (1981) Radioactive Mineral Deposits of the Pembroke-Renfrew Area; Ontario Geological Survey Mineral Deposit Circular 23. Yang, G., Li, G., Xiong, M., Pan, B. and Yan, C. (2011): Hydroxycalciopyrochlore, IMA 2011-026. CNMNC Newsletter no. 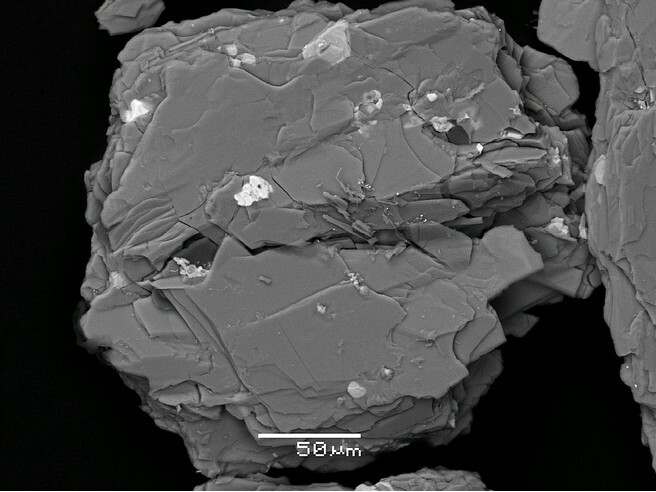 10, October 2011, page 2554; Yang, G., Li, G., Xiong, M., Pan, B., Yan C. (2014): Hydroxycalciopyrochlore, a new mineral species from Sichuan, China. Acta Geologica Sinica - English Edition, 88, 748–753. Drábek;, M., Frýda J., Šarbach M., Skála, R. (2017): Hydroxycalciopyrochlore from a regionally metamorphic marble at Bližná, Southwestern Czech Republic. Neues Jahrbuch für Mineralogie - Abhandlungen: Journal of Mineralogy and Geochemistry, 194, 49-59. Bonazzi, P., Bindi, L., Zoppi, M.,Capitani, G. C. & OLmi, F.(2006): Single-crystal diffraction and transmission electron microscopy studies of "silicified" pyrochlore from Narssârssuk, Julianehaab district, Greenland. American Mineralogist: 91:794-801; Atencio D., Andrade M.B., Christy A.G., Giere R., Kartashov P.M. (2010) The pyrochlore supergroup of minerals: nomenclature. The Canadian Mineralogist: 48: 673-698.